Background: Nausea and vomiting are among the most feared side effects of chemotherapy and can prevent cancer patients from completing their treatment regimens. Rolapitant is a highly selective neurokinin-1 (NK-1) receptor antagonist with very good oral activity, central nervous system penetration and a long (180-hour) plasma half-life. Unlike other available NK-1 receptor antagonists, rolapitant does not inhibit or induce cytochrome P450 (CYP) 3A4. Methods: Findings from recent phase II and III clinical trials of rolapitant in patients receiving highly or moderately emetogenic chemotherapy are reviewed and discussed. Results: The addition of a single-dose of rolapitant to combination 5-hydroxytryptamine type 3 receptor antagonist and dexamethasone regimens provided increased protection against chemotherapyinduced nausea and vomiting, a benefit that encompassed the entire at-risk period investigated (0-120 hours after initiation of chemotherapy) in patients receiving highly or moderately emetogenic chemotherapy. Rolapitant was well tolerated by patients in these trials, with the overall frequency of treatment- related adverse events similar in patients receiving rolapitant (7.0%) and active placebo (6.3%). Conclusion: Rolapitant’s favorable toxicity profile and lack of CYP3A4-related drug-drug interactions indicate that it would be a suitable treatment for older patients or those with multiple comorbidities, who are likely to be receiving a number of concomitant medications. Future studies should focus on the role of rolapitant in the control of chemotherapy-induced nausea and vomiting in patients receiving multiple-day chemotherapy, specific chemotherapy agents or high-dose chemotherapy and stem cell support. Keywords: Antiemetics, chemotherapy-induced nausea and vomiting, highly emetogenic chemotherapy, moderately emetogenic chemotherapy, multiple cycles, neurokinin-1 receptor antagonists, phase III clinical trials, rolapitant. Keywords:Antiemetics, chemotherapy-induced nausea and vomiting, highly emetogenic chemotherapy, moderately emetogenic chemotherapy, multiple cycles, neurokinin-1 receptor antagonists, phase III clinical trials, rolapitant. Abstract:Background: Nausea and vomiting are among the most feared side effects of chemotherapy and can prevent cancer patients from completing their treatment regimens. 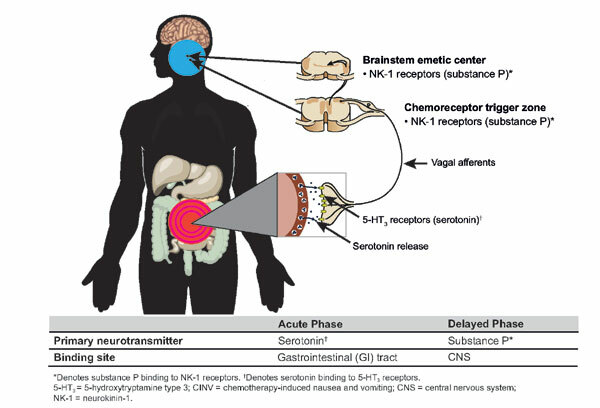 Rolapitant is a highly selective neurokinin-1 (NK-1) receptor antagonist with very good oral activity, central nervous system penetration and a long (180-hour) plasma half-life. Unlike other available NK-1 receptor antagonists, rolapitant does not inhibit or induce cytochrome P450 (CYP) 3A4.